We are partnering with Dame Kelly Holmes Trust to deliver a free of charge transformational, year long programme, for young people in Liverpool, funded by Sport England. 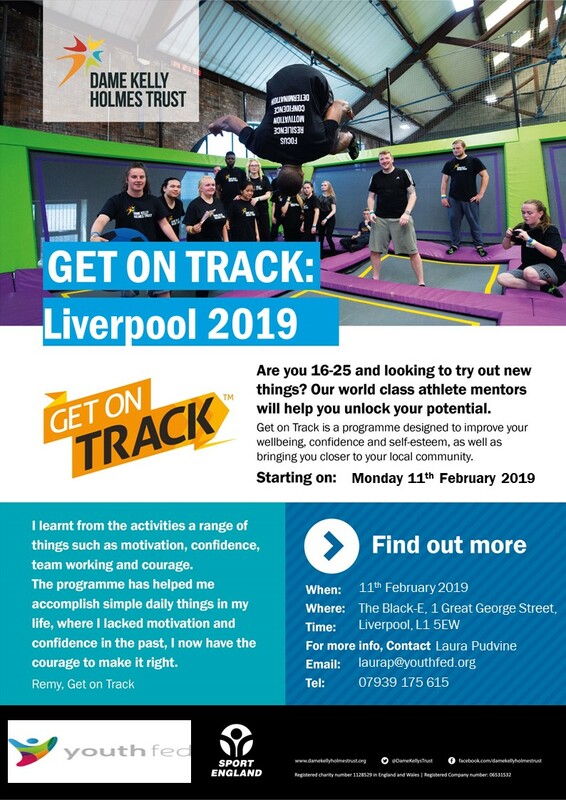 Get on Track is designed to improve well-being, confidence and self-esteem, as well as bringing young people closer to their community. Dame Kelly Holmes Trust have been supporting disadvantaged young people to change their lives for the past 10 years. During this time, they have developed a model which has been acknowledged as highly successful and which delivers real and sustainable change in young people’s lives. This programme looks at each person, their aspirations and ambitions and unlocks the attitudes and behaviours needed for young people to achieve their own goals through the support of their skilled athlete mentors. The aim will be to engage young people who are currently inactive and over the course of 12 months, inspire and motivate them to become active. The programme is designed to help overcome barriers to engagement and reach those who would not engage in traditional routes or consider physical activity as part of their current lifestyle. The programme will be delivered by two World Class Athlete Mentors and will consist of 11 sessions over a 12-month period which consists of 60 learning hours. The programme framework consists of 3 days in week 1, 1 day a week from weeks 2 to 5, and intermittent sessions over the following 10 months. Please refer to the timetable below for all dates/times the young people will be required to attend. Please share with any of your contacts and send all referrals directly to myself, providing young people’s name, dob, contact number and address. and intermittent sessions over the following 10 months. Your feedback is important to us. It will help us improve your experience of using Liverpool's Early Help Directory in the future. 2 How did you hear about Liverpool's Early Help Directory? 3 Why were you visiting the directory today? 4 Did you find the information you were looking for? If not, what couldn't you find? 5 How easy did you find the directory to use? 6 How could we improve your experience of using the directory?